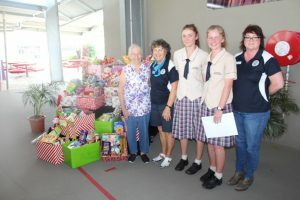 St Stephen's Catholic College, Mareeba > Latest News > The Spirit of Giving! 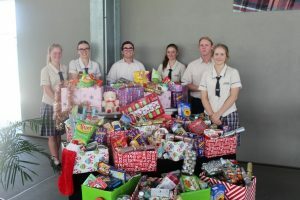 At the college’s final assembly and thanksgiving mass on Friday 30 November, the 2019 Social Justice Committee presented the Christmas hampers to St Vincent de Paul for distribution to local residents. Incoming President and Vice-President, Sienna Cheesman and Arwen Rose presented the hampers to representatives from St Vincent de Paul. From left to right: Mrs Eileen Rains, Mrs Brez Goulding, Arwen Rose, Sienna Cheesman and Ms Davina Dansie. 2019 Social Justice from left to right: Sienna Cheesman (President), Nataliah Lopez (Secretary), Brendan Wright (Member), Arwen Rose (Vice-President), Benjamin Struthers (Member) and Teagan Schermer (Vice-President). 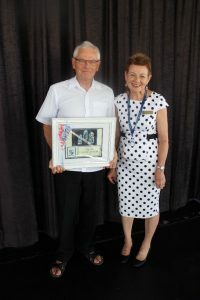 The college said farewell to Fr John Sullivan who is leaving the area. Mrs Pinese presented a thank you gift to Fr Sullivan following mass.